Just yesterday we got word that Broadway star Nolan Funk was the latest to sign on to the untitled Chronicles of Riddick sequel, or the third film in the Pitch Black franchise if you prefer. Either way this flick has had its share of troubles, but the franchise's star Vin Diesel has shown the public nothing but optimism about the sequel he's long-wanted to do. And by the public, I mean his Facebook following. 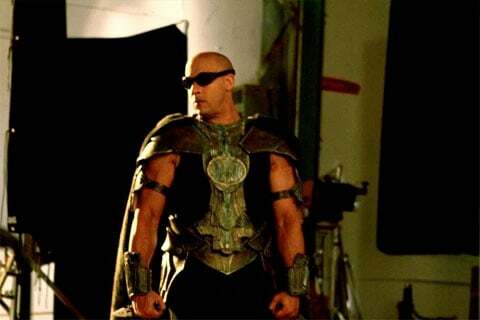 The undeniably likeable action star has been sharing concept art with his fans through his Facebook page, and now has revealed a shot from the set with the endearing caption, "Grateful for the opportunity to make magic..."
Here we see Diesel in his trademark Riddick glasses, decked out in some swanky futuristic attire. Behind him is just a random array of stands and flags with no hints to what the movie's set looks like, which makes sense as Diesel and the feature's writer-director David Twohy have been tight-lipped on what the latest Riddick flick would contain. However, early casting sides of the film reveal that this untitled sequel will have a lot in common with Pitch Black, both plot-wise and budget-wise. The first film in this soon-to-be trilogy had cost $23 million, a meager budget for a CGI-action flick, yet went on to earn more than $53 million worldwide and proved Diesel's action-hero prowess. Pitch Black earned a sequel four years later with The Chronicles of Riddick, which dropped the gritty leanness of David Twohy's original in favor of a grander scope, galaxy-wide war and a bloated budget of $105 million. Ultimately, it tanked at the box office, and crippled Twohy's career though Diesel continued to score major roles in blockbusters with his winning combination of intimidating brawn and irresistible charm. Twohy would not get the chance to direct again until 2009, where he helmed his script for the woefully underseen and undervalued thriller The Perfect Getaway, which starred Timothy Olyphant, Steve Zahn, and Milla Jovovich. But now Twohy and Diesel are reunited, and judging by Diesel's status updates it feels so good!